Are Gordon Ramsay Scrambled Eggs really that good? Oh hell yes! Scrolling through Facebook last night there was a Gordon Ramsay eggs video story on my feed about Jamie Oliver vs. Gordon Ramsay scrambled eggs and who made it better. Of all the different types of food, people are tempted by; scrambled eggs would never make it to the top of anyone else’s list except mine. I have this weird history with scrambled eggs because everyone eats them, but most people never make them right. To understand how strongly I feel about this, I included a recipe in my cookbook on how to scramble eggs correctly because as simple as this may seem, to make soft, melt in your mouth scrambled eggs there are some basic principles a cook needs to adhere especially in the art of not overcooking eggs. So, like the weirdo I am, there was a strong desire to make Gordon Ramsay’s scrambled eggs recipe at 1 am. Only stupid people (raising my hand), lie in bed late at night looking at food-related internet stories and social media posts believing they are above the temptation to get up out of bed and go to their kitchen to satisfy an internet food-induced craving. Sometimes this works, most of the time it doesn’t. But let the record show I was victorious in staying in bed last night. Some people thought it was ridiculous I included a scrambled eggs recipe in my cookbook. But I did because a lot of people understand this truth… there is a difference between good, bad, and great scrambled eggs. No one likes overcooked, dry scrambled eggs, and the difference usually comes down to mouth-feel. Watching the video last night between who had the better scrambled eggs, I was instantly intrigued by Ramsay’s take on one of America’s favorite breakfast dishes. Jamie Oliver prepared scrambled eggs how most people do. The only difference between how he and I prepare eggs is that I like to mix the raw eggs with a tiny bit of heavy cream to make them lighter in texture. Ramsay went all chef-y using crème fraiche and a cooking technique I thought “whatever”. However, after watching how everyone ooh’d and ah’d over his eggs I was not only curious, I was determined to find out for myself. I debated with myself whether or not I should go down to my kitchen and make myself some Gordon Ramsay eggs because my curiosity became a mild obsession since I knew I had all the ingredients on hand except for crème fraiche (for the record I never buy crème fraiche), which was fine because I had heavy cream and plain Greek yogurt. I’m all for adequate substitutions. The only thing I did not like about how Ramsay made his custardy eggs was his technique. It seemed a bit unnecessary and intentionally so Gordon Ramsay-like —interpret as you will. Ramsay prepared his eggs in a saucepan with whole eggs and butter going back and forth with the heat while mixing them until the butter melted and the eggs looked like traditional mixed raw eggs. I like to cook efficiently without compromising flavor or texture. Needless to say, cooking Chef Ramsay’s eggs were in order, and somehow I did resist getting up out of bed and fell asleep thinking about how I would prepare the eggs the moment I woke up, which I did. If you haven’t watched the video, watch the video to understand why I adapted my methods to his recipe which did not disappoint in the least bit. In fact, both my husband and I really enjoyed Ramsay’s chives studded custardy eggs. Truthfully, they were amazing. The texture is slightly custard-like with a little bit of brightness from the yogurt. The chives added a layer of flavor to elevate the dish to a heightened level of enjoyment you would come to expect in a high-end breakfast restaurant. Here is how I differed in my approach to this recipe. -I pre-mixed my raw eggs with a pinch of salt and pepper with a tiny bit of heavy cream. I like using a stick blender to fluff them up. Ramsay does not pre-mix nor does he add any other liquid to the eggs. -Instead of stirring the mixture of raw eggs and a chunk of in-melted butter in a saucepan, I melted the butter in a non-stick frying pan on medium-low heat. Once the butter was melted, I added the mixed eggs to the pan and stirred the eggs, so the butter was well incorporated. -From there I slightly increased the heat to medium and gently cooked the eggs while occasionally folding them onto themselves. Ideally, you want the eggs to be cooked through but slightly wet-looking. The eggs will look undercooked but not uncooked. -Lastly, I added a tablespoon of plain Greek yogurt and a teaspoon of heavy cream and stirred everything, so it was well incorporated. The eggs still had a wet sheen to them, and this is when I turned off the heat and added a tablespoon of chopped chives gently folding them until evenly distributed. I plated the eggs immediately and seasoned them a little more with salt and pepper to my liking. 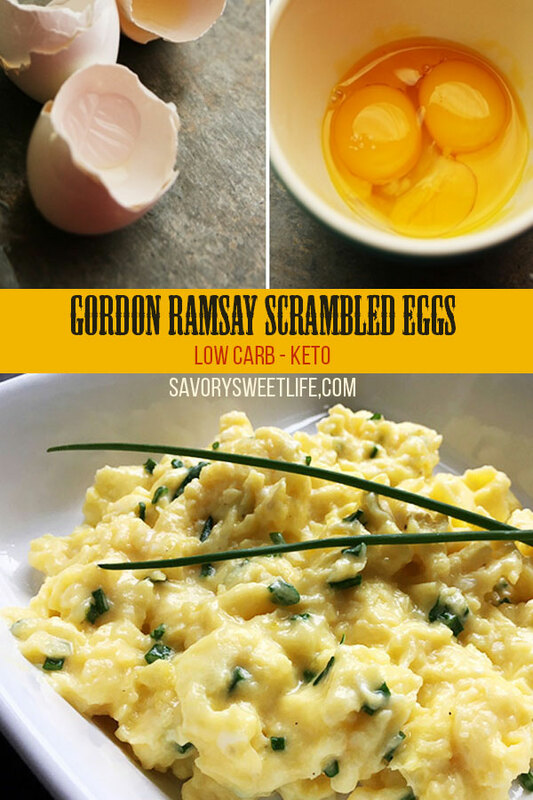 If you are a scrambled eggs aficionado, I encourage you to try Gordon Ramsay’s eggs recipe. You will not be disappointed. And if you’re like me, follow my suggestions and substitutions for efficiency’s sake without compromising the integrity of the dish. Sidebar: The only herbs to survive winter in my herb pot were the chives and mint. Since Spring is here, now would be a great time to make a container garden of herbs you frequently enjoy and use. 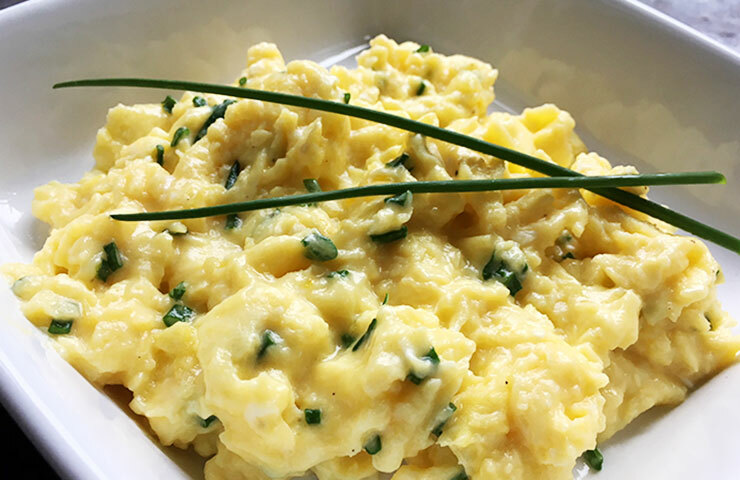 A custard like scrambled egg recipe made with eggs, butter, heavy cream, yogurt, and chives. In a medium bowl whisk or blend the eggs, cream, and a pinch of salt and pepper until lightly beaten. In a nonstick skillet, melt the butter over medium low heat. Once melted, slowly pour the egg mixture into the skillet and gently mix with the butter. Increase the heat to medium. When the soft curds form, gently stir the eggs with a heat resistant rubber spatula from one side of the skillet to the other, folding the eggs over themselves until they look undercooked. Add in the yogurt and heavy cream. Continue to gently fold the eggs until the yogurt and cream have been thoroughly folded in. The eggs will look slightly wet but not undercooked. Turn off the heat and fold in the chopped chives. Season with additional salt and pepper if necessary. Omg i used this as my first time making eggs and it turned out amazing, my friends loved it! Wow! This turned out great! I’m doing a low-carb diet and this was perfect from my standard scrambled eggs. Did you make them Jane? I’ve made them 4 times since this post! I had to raise my hand too! I’m one of those ” sitting in bed looking at food on pinterest thinking I really want that but will wait until tomorrow” persons. I also saw the episode with Gordon Ramsey making these eggs and even printed them out (they are somewhere as I write this) but never got around to making them. Now, after seeing your post, I am once again sitting in bed, just printed your recipe and yes, inspired by you, this time I am going to get up…in a short while….and make these eggs!